Portability provides an opportunity for HCV tenants to relocate to another housing authority outside of the initial housing authority’s jurisdiction. Effective April 1, 2019 the Admin Fee paid to other agencies is $ 51.00. 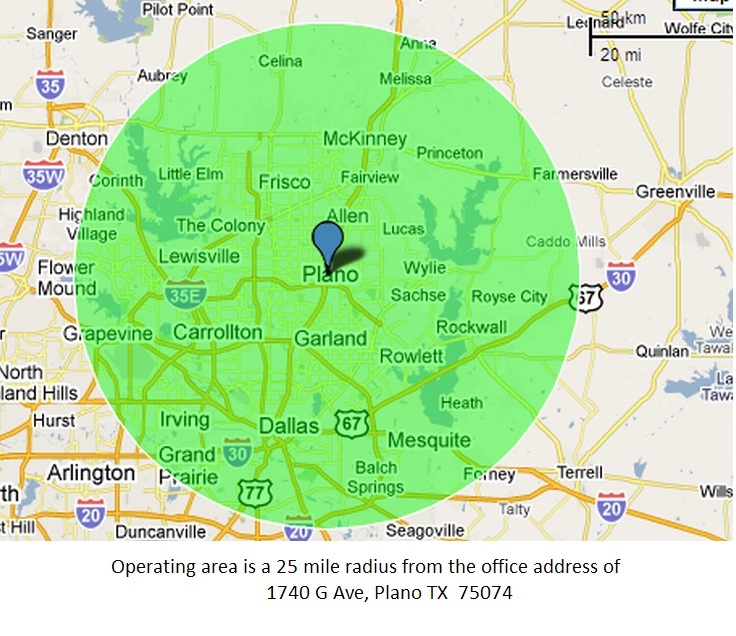 Plano Housing Authority has a 25 mile radius jurisdiction from our Administrative Building located at 1740 Ave G, Plano TX 75074. Click the map below for a larger version. 1. Contact your current housing authority counselor to begin the portability process. Your current housing authority will issue you a voucher to allow you to port here. 2. Plano Housing Authority is administering vouchers, we are not absorbing. Our Payment Standards are generated by the zip code of the assisted unit. Click the Allowances tab to see the Payment Standards for each zip code. We do not know the payment standard that you will have because you will need to select the property first. 3. Your current counselor will need to mail your paperwork to the attention of PORTABILITY at Plano Housing Authority, 1740 Ave G. Plano, TX 75074; or fax your paperwork to 972-516-0251 or email your paperwork to kteague@planoha.org K Teague can be reached at extension 370. 4. Once your counselor notifies you that your paperwork has been sent to Plano, you will need to contact the Plano Portability Counselor to schedule an appointment. You must bring legible copies of birth certificates and social security cards for head of household and all family members. You must also provide proof of household income and a valid photo ID for head of household and all family members 18 years or older. Portability Briefings are usually conducted on the first Wednesday of each month at 1:00pm and on the third Wednesday of each month at 9:00am (except for December). Click the Calendars link to see the briefing schedule. All paperwork must be received from your initial housing authority for you to attend the briefing. During the briefing you will be issued a voucher from Plano Housing Authority which relates to the date of the voucher forwarded from your initial housing authority. You will also be given a packet of information you will need to search for housing. Plano Housing determines the appropriate number of bedrooms under the Plano Housing subsidy standards and enters the family unit size on the voucher that is issued to the family. The family unit size does not dictate the size of unit the family must actually lease, nor does it determine within a household who will share a bedroom/sleeping room. One bedroom for each two persons within the household. Two people per room. If you are a Plano Housing Authority client requesting to relocate or port you must inform your counselor at your annual recertification briefing and complete a request to relocate form at that time. Forms are available in the Forms link and at the Front Desk. The above link will allow you to find and contact all Housing Authorities in the country. We do not participate in the FSS program. If you are porting to our area and you are a current FSS participant you will want to port to another agency that has an active FSS program.